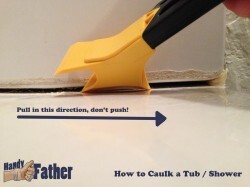 How-to caulk a bathtub or shower enclosure – This is a common DIY project for the Handy Father. I found myself faced with this situation recently. The first thing to consider when caulking the bathtub is whether or not the job is being done for the first time, or if you’re replacing the caulking. If you’re doing the caulking for the first time, skip down to the application portion of this post. I’m assuming that you have existing caulking to remove. I highly recommend that you purchase a caulking remover tool. Often they come in a kit with a caulking applicator. These are a good value for the price, usually. A caulking removal tool (pictured right) is made of plastic and, if used properly, won’t damage the surface of your tub or shower enclosure. It is also possible to use a putty knife or flat screwdriver, but this isn’t recommended because you risk damaging the tub. 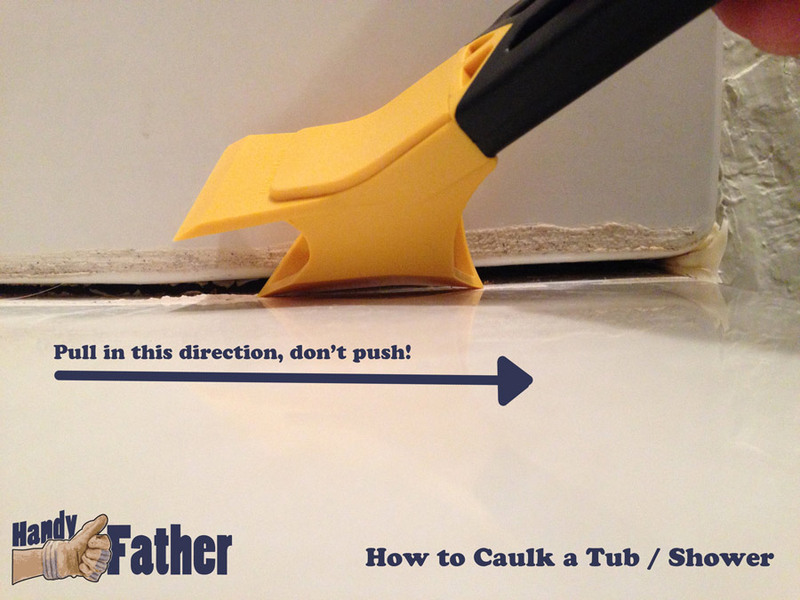 The caulking remover tool should be pulled along the existing caulking, not pushed. This will effectively remove an existing bead of caulk. Once the bead is removed, use the flat, putty knife-like end of the caulking removal tool to gently scrape away any residue left over. Be sure the area is clean and dry before proceeding to the application of caulk for the bathtub or shower enclosure. The tools you’ll need for caulking the bathtub are as follows: (1) tube of tub / tile caulk , a caulking gun , scissors or utility knife to open caulking, and a Perfect Bead Caulk Finisher for smoothing the caulk. Step 1: Be sure the area is clear of debris and is dry. Step 2: Open your tube of caulking with a utility knife, cutting an opening at a 45º angle with a utility knife. Your caulking gun may have a metal prod that should be inserted into the cut end of the caulk tube to puncture the air tight seal. Be sure to puncture this seal! Step 3: Insert tube of caulk into the caulking gun and pull the trigger a few times to prime the caulk. Proceed to lay a bead of caulk per manufacturer’s recommendation on the caulk tube. Step 4: Use a caulk tool to smooth the bead and give you that finished look. If you don’t have a caulk tool, then your finger will work just fine. Be sure to clean the tool often to avoid a messy bead. Step 5: Let the caulk dry according to the manufacturer’s recommendations, and enjoy your newly sealed bathtub! This has been how-to caulk a bathtub or shower enclosure. We hope you find these tips Handy. Let us know how it went in the comments below, or tweet @HandyFather. Another valuable resource for how-to caulk a bathtub is in this book:How to Fix Everything For Dummies available online at amazon.